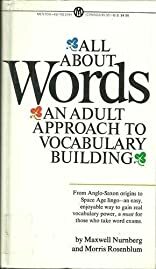 All About Words: An Adult Approach to Vocabulary Building was written by Maxwell Nurnberg and Morris Rosenblum. 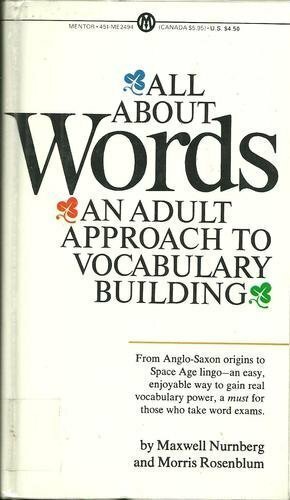 All About Words: An Adult Approach to Vocabulary Building was published by Signet. Subjects of All About Words: An Adult Approach to Vocabulary Building include Early learning: first word books, English language, First word books, Glossaries, vocabularies, etc, Non-Classifiable, Nonfiction, Nonfiction - General, Pre-school & Early Learning, Reference / General, and Vocabulary. About Maxwell Nurnberg (Author) : Maxwell Nurnberg is a published author. Published credits of Maxwell Nurnberg include All About Words: An Adult Approach to Vocabulary Building. About Morris Rosenblum (Author) : Morris Rosenblum is a published author. Published credits of Morris Rosenblum include All About Words: An Adult Approach to Vocabulary Building.